Today I’m going to review the new Bitdefender Internet Security 2019. 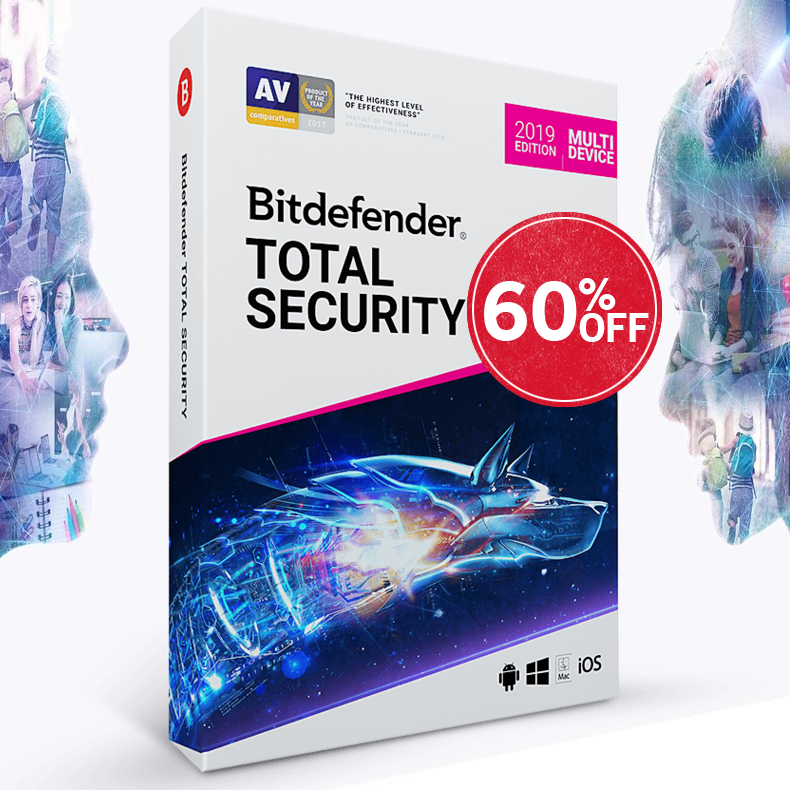 Bitdefender, winner of multiple PCMag nominations, has finally released the newest edition of Internet Security, so, let’s take a look at the new and updated features, as well as the new interface in Bitdefender Internet Security 2019. 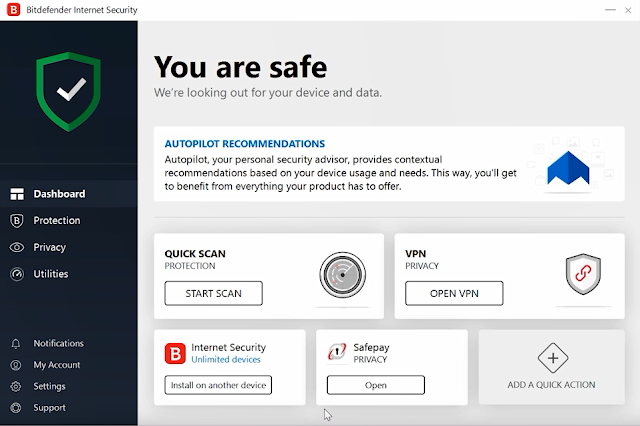 One of Bitdefender’s highlights, the Autopilot, designed to apply optimal security settings without user intervention, has been rethought to also assist and educate users on new features; as well as dynamically choose which relevant functions to show in the dashboard – this way you’ll be able to get more from Bitdefender. Bitdefender Internet Security 2019 offers you a VPN service built right into the software itself; in short, a VPN or Virtual Private Network, routes your traffic through an encrypted and secure tunnel, ensuring that your personal data transferred over Internet stays private, and also hides your actual IP address. The VPN included with Bitdefender out of the box is pretty limited, since there’s a daily 200 megabyte traffic cap, but the Premium VPN is unlimited and allows you to choose which country to tunnel to, allowing you to access geographically restricted content. A true highlight of this software. 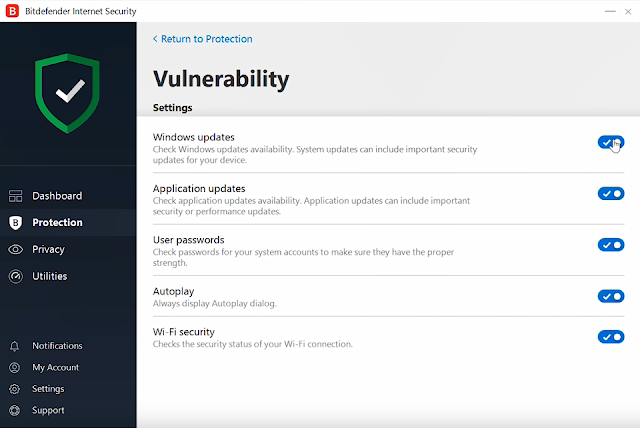 The vulnerability scan will check your operating system and network connection for possible malware entry points like skipped Windows security updates or missing passwords. Bitdefender also allows you to customize reports done by the vulnerability scanner: for example, you can skip checking the aforementioned Windows updates, though it’s not recommended. Overall, the vulnerability scanner is a great tool for newcomers to computer security. The Firewall feature, accessible in Internet Security edition of Bitdefender, adds a powerful layer of network protection that monitors ingoing and outgoing traffic, and decides whether or not to allow the data packages to pass through. 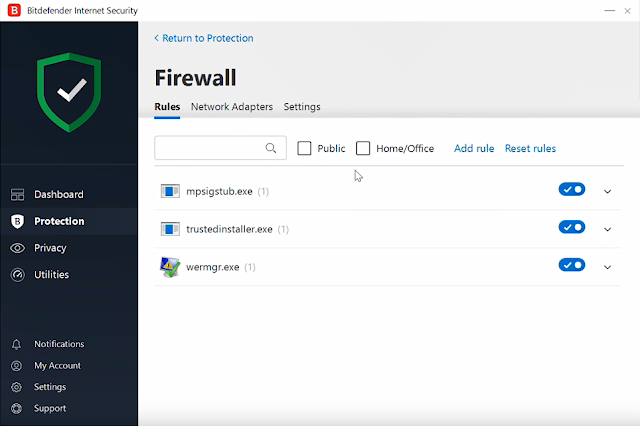 You can also monitor which applications tried to access the Internet and when, allowing you to intelligently control applications you don’t fully trust with your data. One feature I really like is the ability to apply individual limitations to different network connections: for example, if you don’t trust an open Wi-Fi hotspot to transmit sensitive data, but you have full confidence your home connection, you can apply limitations you consider suitable for each connection. Wi-Fi hotspot protection techniques to make sure your transactions are protected from all fronts. The web filtering technology, Web Attack Prevention, has also been improved this year, this feature makes sure that users never land on a harmful website by checking addresses you visit against a massive database of malicious domains. This feature will protect you against most browser-related attacks. 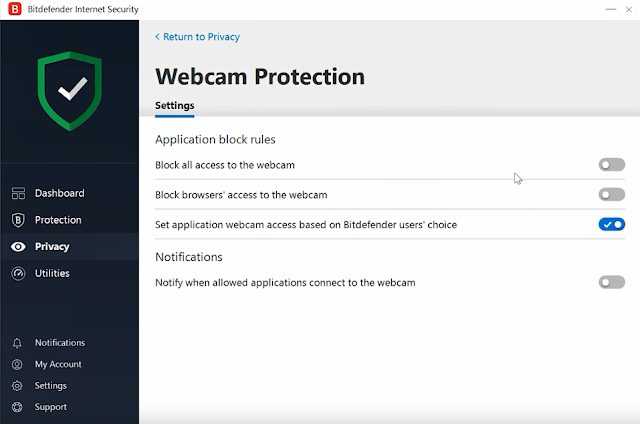 Webcam protection is another feature offered in Internet Security. This security module monitors when applications try to get access to your webcam, and notifies you every time it happens. 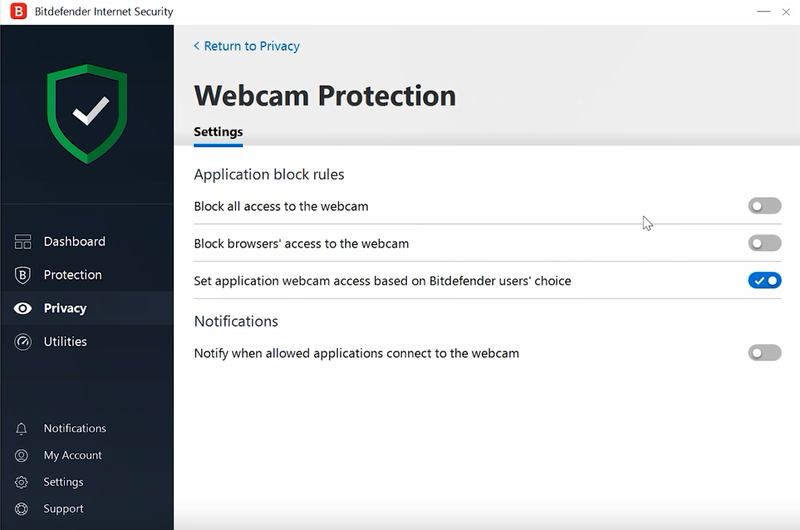 You can also permanently block access to the webcam to some applications. Alternatively, if you have no use for the webcam at all, and wish to disable it completely on a device that has it built in, like a laptop, you can do so! Prevents botnet attacks and keeps sensitive information away from unencrypted data forms. The antispam block, accessible in Bitdefender Internet security, works with local email clients like Microsoft Outlook or Mozilla Thunderbird. It offers protection from frequent attack avenues like spam and phishing. By using a various intelligent filters, it determines which messages are spam, and which are not; but it also allows you to apply your own filters, for example, you can block messages containing specific character sets, like Asian characters and Cyrillic alphabets, and you can also create a list of trusted domains and addresses, to prevent false flagging. The File Encryption module allows you to create encrypted, password-protected file vaults, where you can safely store your sensitive information. Keep in mind though, that decrypting filevaults will take time, so the bigger it is, the more resource intensive it’ll be to access those files. 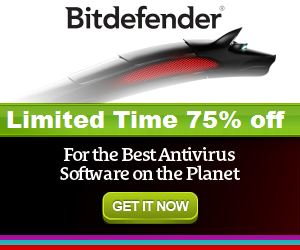 Overall, Bitdefender Internet Security 2019 offers a great tool-set focused on Web and virus protection. The interface is easy to understand and straight to the point, and the performance hit is minimal.